Many bloggers do not know that adding Meta Description in blogger is very essential that it form good part of Search Optimization Engine (SEO) for their blog. Well, the purpose of Meta Description is for people to locate your blog and search for all your posts in search result, and that gives you more clicks from people visiting any Search Engine to find your blogs listed. Adding Meta Description in blogger usually displayed to describes your website home page and your title posts. It always appears on your browser bar as the header to explains information about your website and tell what your website is all about. To know better how any Meta Description works you can type any domain name or website on your browser bar or Google Search, you will see display on header describing the page of the site as header page and all information about the site. Whenever you want to write new post, you will now be copy and past your description on each of your new post created post. 3. 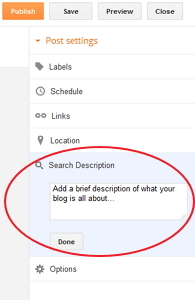 Write your description in example showed above and click "Done"
NOTE: Any time you write New Post, always include your Meta Description on each of your new post. 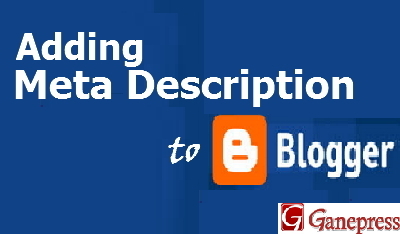 Now your blog will be listed in the search engine and you can visit www.metachecker.net to see how your blog meta description is analysis online. Feel free to give your feedback if it work for you and also share this post with your friends on social media.